According to the 2012 Global Gender Gap Report of the World Economic Forum (Davos Forum), of 135 countries worldwide, Japan took the 101st place in terms of the economic gap between men and women, three ranks down from the previous year’s 98th. Though it has already been a quarter of a century since the Equal Employment Opportunity Law was enacted in 1986, the social status of Japanese women has made little progress. In 1990, a non-fiction book titled “Maybe I won’t get married…Syndrome” became a best-seller. It depicted the real lives of women in their 20s and 30s who sought economic and mental independence against a backdrop of the bubble economy. Ms. Shiho Tanimura, the author, is now working on a serial novel, “Isobue (beach calling),” whose heroines are “ama (women divers)” of the Shima Peninsula in Mie Prefecture. “If there is a sea in front of you, you need nothing but yourself to live on diving, whatever country you are in. It is a noteworthy way of life for women who want to be independent in modern society,” Ms. Tanimura says. 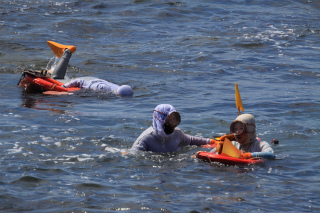 Ama woman divers, who go under water to collect fish, shellfish and sea weed, using nothing but their bodies, exist only in Japan and Korea (mainly on Jeju Island). It is said that ama divers have at least 5,000 years of history. Aging and the lack of young successors have, however, reduced the number of professional ama and endangered the continuation of the occupation. According to a 2010 survey by the Toba Sea-Folk Museum, Japan has now 2,174 ama divers in 18 prefectures including Mie, Ishikawa (Wajima), Chiba and Shizuoka; but the figure is only one-sixth compared with 40 years ago. Korea has 4,881 ama (2011) in such places as Jeju, Busan, and Tean; only one-fifth of the figure of about 40 years ago. There are 973 ama in Mie Prefecture. One of them, Ms. Chizuru Hamaguchi, who has a 21-year-old daughter, has been diving for 16 years. She dives only about 20 days between the end of June and the middle of September to collect mainly abalone. “I have worked at my own pace in the familiar sea since my childhood and I learn to lead a natural life,” says Ms. Hamaguchi. 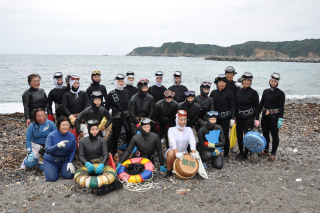 “I am the youngest of the seven local ama divers and chats with my seniors, led by an 82-year-old, who teach me various ama skills, give me food for mental growth,” continues Ms. Hamaguchi. Four years ago Ms. Naomi Suzuki, originally a Tokyo-based art designer, started to work as an ama at Shirahama in Chiba Prefecture after having cleared complicated problems such as fishery rights for non-local residents. 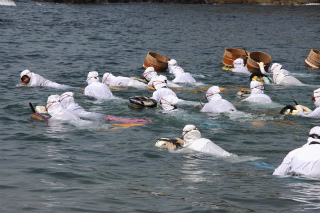 Since 2007 the Jeju Haenyeo (ama) Museum in Jeju Island, Korea, and the Toba Sea-Folk Museum, Japan, have been cooperating to register the ama fisheries as UNESCO’s Intangible Cultural Heritage, regarding the traditional ama divers and their culture that has lasted over a long period as a valuable resource of East Asia. In June this year, Mie Prefecture, Toba City, Shima City, local fishery cooperatives, and other related organizations established a Council for Ama Promotion, which is now playing the central role on the Japanese side. 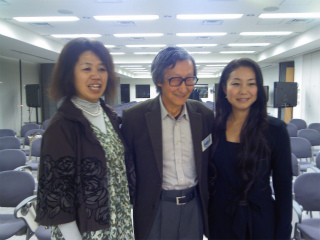 Mr. Yoshikata Ishihara, Council Chairman and President of the Toba Sea-Folk Museum, is the leader of the movement. He has been actively working with determination, “The ama culture is a marine culture shared by Japan and Korea and in particular for people leading ordinary lives. We have to keep and hand down that culture.” He maintains that woman divers have long been independent professionals, practicing natural conservation by not collecting too many marine resources at one time and that they are the central part, or kizuna bonding, of fishing communities. Dr. An Mijeong, Professor of Korea Maritime University, which studies the maritime culture of Korean ama (haenyo, or chamnyo in the Jeju dialect), points out that a Korea-Japan international academic conference held at the Jeju Haenyeo Museum kicked off the formation of a cross-border local network of Jeju and Toba City. She says that the ama maritime culture based on dive fishing is not bound by borders. According to Professor Akira Tsukamoto of Mie University, Jeju’s ama divers traditionally went to Tsushima or Shizuoka as migrant workers, and from Japan after the Meiji Restoration Shima’s ama divers went to Korea in line with Japan’s national policy of advancing overseas. Through registering the ama culture on the world heritage list, Professor An regards it not only as a traditional and ethnic culture of Japan or Korea but also as an East Asian “maritime culture” in light of dive fishing industry in globalization, and wants to find and share a universal value of human beings. Since this summer Japan-R.O.K. relations have seen tensions over a territorial issue. However, events participated in by the Japanese and Korean people concerned with ama culture were held on schedule: the Expo 2012 Yeosu Korea in July, the fifth Ama festival in Jeju in September, and an Ama get-together in Shima, Mie Prefecture, in October. In 2013, the Ama summit is scheduled to take place in Wajima, Ishikawa Prefecture, and also the Ama festival in Jeju in October. Exchanges between ama divers in Japan and Korea have been continuing calmly and steadily despite troubles on the sea, their working place. Since Japan and Korea jointly hosted the 2002 FIFA World Cup, exchanges between the two countries have developed into a new direction centering on the youth culture. And the culture of ordinary folks, in particular the ama, who have lived with nature to protect the environment and local communities for a long time, should be handed down to the future as the maritime culture of East Asia. Through the activities for registering the ama culture as Intangible Cultural Heritage of UNESCO, the exchange of the multiple histories and cultures of Japan and Korea will be shared by the world community.